← How to convert PDF to TIF and make tif colorful as original pdf? How to convert html to pnm format? HTML Converter Command Line will be a good choice if you want to convert html to pnm.Because HTML Converter Command Line allows you to convert web pages to PDF, PS (postscript), WMF, EMF vector formats.It also allows you to create previews or thumbnails of web pages in a number of different formats, such as TIF, TIFF, JPG, JPEG, GIF, PNG, BMP, PCX, TGA, JP2 (JPEG2000), PNM, etc. The steps here will show you how to convert html to pnm format. Step1.Download HTML Converter Command Line at http://www.verypdf.com/htmltools/htmltools.zip. 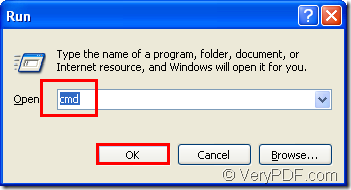 2.Install HTML Converter Command Line.When you finish loading the software,you will find it is a zip file.You should unzip it first then it can be used.But if you want to use HTML Converter Command Line smoothly without any limitation, you should register it in cmd.exe dialog with the code you get when buying HTML Converter Command Line. (1) click “start” – “run” and input “cmd” in “open” edit box.Then click “OK” button to run cmd.exe.Please look at figure1. 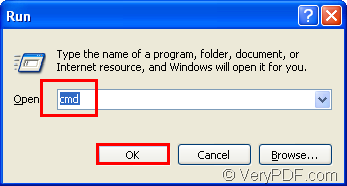 (2)In cmd.exe dialog box,you should change the current directory to the installation path of HTML Converter Command Line by “cd” command.Then input the register code and press “Enter” button on your keyboard.Please look at figure2. The command cd "C:\Documents and Settings\admin\Local Settings\Temp\htmltools" means change the current directory to C:\Documents and Settings\admin\Local Settings\Temp\htmltools. Step2.After registering,you can input commands in cmd.exe dialog box to convert html to pnm.Please look at figure3. "C:\Documents and Settings\admin\Local Settings\Temp\htmltools\htmltools.exe" stands for the path of htmltools.exe. “www.verypdf.com” stands for the URL of source file—webpage. verypdf.pnm stands for the name of target file which you can set by yourself.But the extension name must be .pnm. Step3.Then you can see the target pnm file in C disk and you can open the pnm file by some kind of viewer like GSview or IrfanView,etc.Please look at figure4. How to convert documents of HTML to PNM? How to set color depth when converting HTML to PNM? How to convert wmf to j2k? This entry was posted in HTML Converter (htmltools) and tagged html to pnm. Bookmark the permalink.